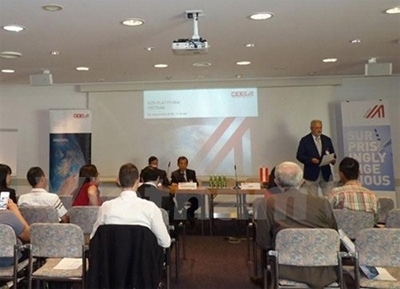 Vietnamese and Austrian enterprises attended a business-to-business platform in Austria on August 23 to seek partners in the fields of clean energy, banking, telecommunications and garments, as well as food. Representative of the Vietnam Chamber of Commerce and Industry (VCCI), Nguyen Hoang Thang, described this event as a good opportunity for Vietnamese enterprises to get up tot date information about the European Union market and then draw up business strategies to access the market more effectively. Participants at the event said Austria would be a good gateway for Vietnamese businesses to penetrate the lucrative European Union market. Meanwhile, Viet n am will help Austrian firms to enter potential markets in Southeast Asia. In his speech, Georg Brunauer, CEO of Novapecc Co, which specialises in hi-tech industries, said his company planned to enter the Vietnamese market as soon as possible. Currently, Austria ranks seventh among the 10 largest importers in the European Union of Vietnamese goods such as footwear, smart phones, electronics and garments, with a turnover of 2.2 billion USD in 2015. Vietnam, meanwhile, is the largest trade partner of Austria in Southeast Asia. Austria's total turnover from exports, including machinery, electronics, steel products and medicines, to Vietnam hit 412 million USD in 2015. The business exchange in Austria was organised as part of a Vietnamese business delegation's trip led by the VCCI to the European Union from August 18 to 28./.